UPDATE: Peter has put on a spring-time offer, valid from today 1st April (not an April Fool's joke!) to 2nd May 2019! Only £235 for the 15 hour course over Friday evening to Sunday afternoon. Select pass from the drop-down menu on under 'buy passes' link. The Art of Yoga Adjustments is training for the skilled practitioner and teachers of yoga asana from all yoga systems. Peter Goodman offers this training based on his many years of practice and teaching. There is risk of muscular-skeletal injury when the yoga student (including ourselves) is misaligned and not in the general form of the pose. A teacher can offer refinements, both with verbal cues and hands-on touch, to help the student experience greater space, freedom and happiness in poses. Over this 15hr training (5 x 3hr classes) we will work with principles of biomechanics and alignment, learn about sensitive and respectful touch, and how to guide the body to good alignment and consequently greater stability and freedom in more than 35 poses. There will be pairwork throughout the course, to learn, observe and feel appropriate touch and adjustments. The practical work is backed up by a visual power point which is provided as a full colour 100 page PDF manual to every participant, send by WeTransfer prior to the course. 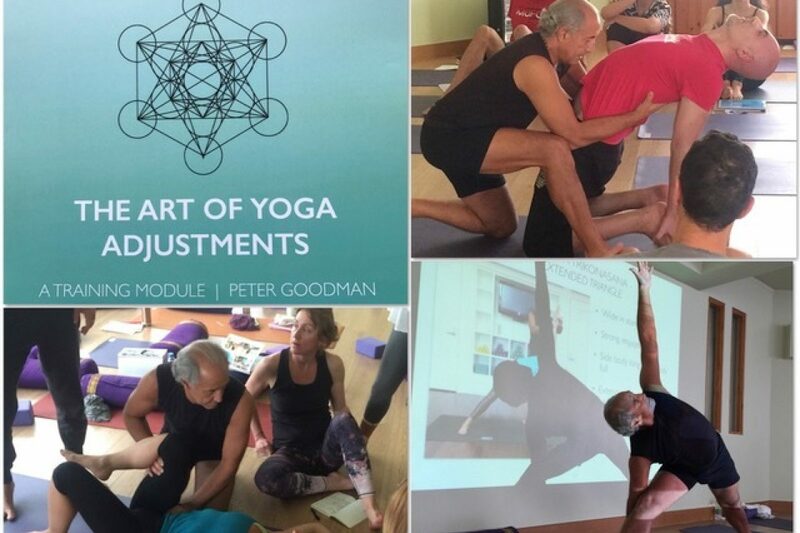 For information about the course content contact Peter via his website or peter@petergoodmanyoga.com. For information about the venue, email info@maitristudio.net. To book, choose the Art of Adjustments pass from the drop-down menu on the buy classes page. Cost: Early Bird £235 (paid by February 14, 2019), £320 thereafter - but do contact us if cost is a barrier to attendance. All hours count towards Yoga Alliance (USA) and Anusara Continuing Education Credits (CEUs) and may count towards Continuing Professional Development (CPD) within the UK and elsewhere (check with your professional body). Peter is also offering an open class on the Friday morning - click here for details. Peter has a playful spirit and loves to share this path of delight through his teaching of yoga. He has been practising yoga for 25 years and has had the great honour and pleasure of travelling worldwide to study with great yogis in many corners of the world. He is passionate and sincere in offering students a place to journey to, a place filled with stability, freedom and integrity in alignment yet never forgetting the joy-filled love of life, the highest teaching life offers! He has a special love for safe alignment teachings, therapeutic yoga and the proper hands on touch aspect of yoga. Peter teaches worldwide and offers private instruction as well as group trainings for the more serious student. Concurrently he has served as a guide and mentor to many along the way seeking his life-earned wisdom and support as they go through major life changes.